"TSR was always a target for criticism. The industry juggernaut that turned DUNGEONS & DRAGONS into a synonym for roleplaying was rightly criticized for its boneheaded business decisions, and its treatment of the rest of the roleplaying community as the enemy in some kind of twisted, scorched-earth warfare. On the other hand - and this can't be denied, even by TSR's staunchest critics - the company came out with some really cool stuff. Case in point: HOLLOW WORLD. ADVANCED DUNGEONS & DRAGONS was the magnet for many roleplayers, but there was once a sizeable audience for TSR's descriptor-less DUNGEONS & DRAGONS line. This game was really more of a linked series of boxed games that began with the "basic" set, moved on to the "expert" set, and so on. These versions of D&D shared more in common than they had differences, but there are still those who swear that the boxed D&D was better than its hardbound counterpart. They may have been right. DUNGEONS & DUNGEONS (not ADVANCED) had a setting all its own: Mystara, AKA The Known World. It was an extraordinarily detailed world for the period, with enough information published in gazetteers and adventures to keep games going for years, if not decades. 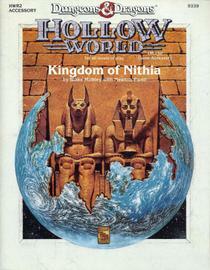 But TSR took the Known World just a bit farther by delving...inside. 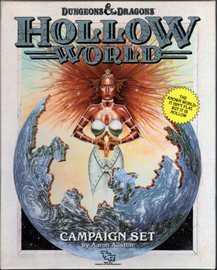 The Known World was hollow, and the first of several outstanding products was the appropriately-titled HOLLOW WORLD, a boxed set of campaign materials. HOLLOW WORLD is a setting that will drive players and DMs alike wild with its possibilities. Part LAND OF THE LOST, part Edgar Rice Burroughs's Pellucidar, HOLLOW WORLD is crammed with opportunities for high adventure. HOLLOW WORLD's materials total 264 pages, and include detailed setting information, dozens of NPCs, full-color maps, and more downright cool elements than in any three other campaign settings. HOLLOW WORLD has it all: yellow-skinned, horsemen orcs, pirates, tribal lizard men, Roman- and Egyptian-imperial analogs, dragon-riding elves...the list goes on and on. And what's more is that it all works together. HOLLOW WORLD is a treasure trove for d20 gamers willing to put the minimal amount of work into converting old D&D stat blocks to Third Edition. Designer Aaron Allston has pretty much moved on to the better-paying world of original fiction, but wrote some terrific roleplaying material in his day. HOLLOW WORLD is his masterpiece. The setting takes all the best elements of the fantastic adventure fiction of the '30s and '40s (dinosaurs, savage men, lost empires) and marries them to the tropes of DUNGEONS & DRAGONS (elves, dwarves, Vance-style magic). It doesn't seem like it ought to make any sense, but it does. Even divorced from the Known World and run on its own, HOLLOW WORLD is well worth the investment. Almost any kind of adventure can be laid in this setting, and the peculiar, inside-out nature of the world gives fantasy gaming a fantastic feel once again. 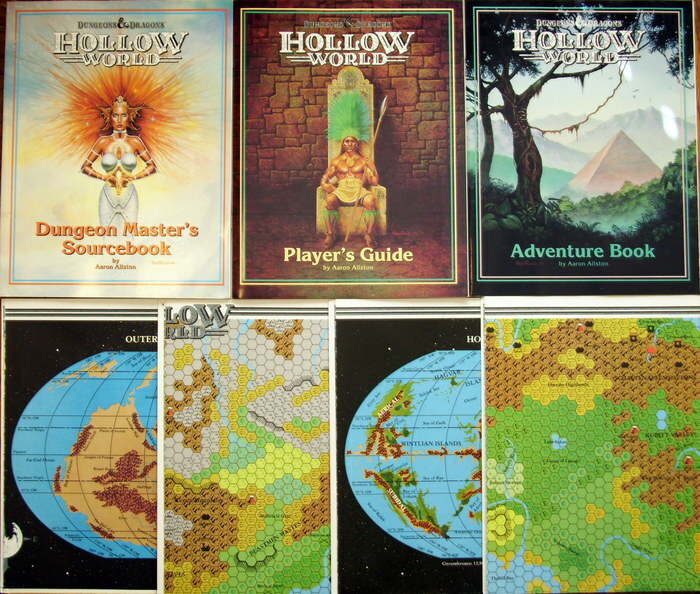 HOLLOW WORLD is a must-buy....from Amazon user "James"
I've seen the maps in this set printed two different ways: As 4 single-sided separate mapsheets, and as 2 double-sided maps. "Within the sphere of the Known World is another world, the Hollow World. There your characters will meet ancient Nithians, long disappeared from the surface world and thought extinct: Blacklore Elves, living in a magical valley and served by automatons --devices that take care of everything, from serving their food to trimming their grass: Azcans, terrifying, war-mongering natives whose taste for battle extends even into their favorite game -- the losers always die -- and many more. Monsters abound as well, from dinosaurs to aurochs. In the Hollow World, the sun never sets. Magic works differently than it does "outside" -- some spells don't work at all. And quite often, getting in is much, much easier than getting out. * A 128-page Dungeon Master's Sourcebook, with everything the DM needs to run an exciting campaign in the Hollow World. Also in this book are extensive entries on all the Immortals represented in the Hollow World: their interests, their allies, their enemies. * A 64-page Player's Book, including how-to's for creating a native Hollow World character and ways to bring a Known World character into the Hollow World. 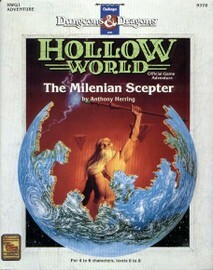 Included in this are new spells specifically for the Hollow World. * A 32-page Adventure Book, containing several starter adventures and entries on the various monsters found in the Hollow World. * Four full-size, full-color map sheets, showing the Known World and the Hollow World, and detailing the central, most populous areas of the Hollow World. * Ways and means to adapt this material to the Advanced Dungeons & Dragons 2nd Edition game!" "In the Hollow World, one civilization above all others is known as the fiercest, most dangerous race, to be avoided as much as possible: the Azcans. Are they truly cannibals, given to performing sacrifices as entertainment? Is their architecture really some of the most extraordinary in all the Hollow World? Is there any truth to the rumor that there is some connection between the Azcans and the outer world tribes of the Atruaghin Clans? Are there any pleasant qualities about this warrior race? Read the book, and find out for yourself. The HOLLOW WORLD boxed set is required for use with this accessory. * This product includes a 64-page DM's booklet with a pullout section especially for players, a 32-page campaign booklet to get you started in an Azcan-centered setting, and a full color poster map of the Azcan lands. 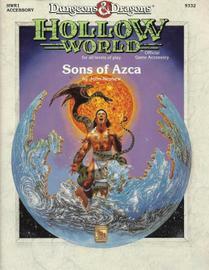 * Sons of Azca expands and builds on material presented in the Blood Brethren trilogy of adventures: Nightwail, Nightrage, and Nightstorm." "The Nithians have long been the stuff of legend on the outer world; they are a little less mysterious in the Hollow World. Ruled by powerful pharaohs, said by some to be Immortals in mortal form, they are the most changeless of all the cultures in this realm. What are the fabled powers of the Nithian pyramids? Is there still a relationship between the Haptans and the Tanagoro tribes? Do the tales of fabulous floating chariots drawn by fiery beasts contain more than a kernel of truth? The answers to these and many more questions are contained in these pages. * This product includes a 48-page DM's booklet, a 48-page players' booklet, and a special four-color, double-sided, poster map of Nithia. * Details on new magical items and Nithian character classes are presented for use in your campaign." 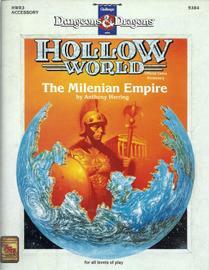 "Once a great people in the Known World, the Milenians now administer a mighty Empire in the Hollow World. Loosely inspired by classical Greece, this is a nation of philosophers, oracles, architects, and mighty pikemen in a strange land where Citizens elect their own leaders, and ultimately the Emperor himself. A society as political as Milenia cannot avoid intrigue, and the land is rife with conspiracies. From the would-be Kings to the lowly slaves, to the dark, grasping servants of chaos. It seems everyone in Milenia belongs to one secret society or another. But even on the surface, there's plenty of drama: from the legendary Acropolis to the eccentric Academy of the Arcane Corisa, adventure calls you to the Milenian Empire! * This product includes a 32-page Adventurer's Guide, a 64-page Campaign Book, and a full color poster map of Milenia, complete with imperial monuments, colossi, and mysterious temple sites. * New magic, monsters, and character types are included, to spice up your Milenian excursions"
"Under the ruins of Barleycorn Monastery, a tunnel leads one thousand miles downward. Through it, a rescue mission into the Broken Lands turns much stranger. Much more serious. For the trail leads to the Hollow World. Launch your D&D game players into fabulous lost-worlds adventure across the Hollow World! Travel the Azcan Empire, Explore the secret labyrinth of the Great Pyramid of Chitlacan. Fly to the core of the world and enter the Smoking Mirror, before the monstrous Prince Kano enacts his devastating scheme - a scheme called: NIGHTWAIL! 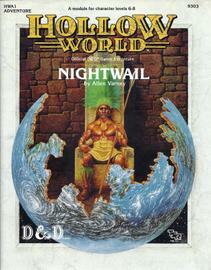 * Nightwail is the first adventure for the D&D HOLLOW WORLD Campaign Set. * This 64-page adventure fits easily into your existing campaign, either as a stand-alone adventure or as part of the continent-spanning Blood Brethren trilogy. These three-linked modules can be played in any order - but the adventure starts here! This adventure is designed for four to six players of levels 6 to 8. EASILY ADAPTABLE TO THE AD&D GAME!" "Snakes fly, stones walk, and colossal monsters burrow in the world's crust - do these omens foretell catastrophe? Perhaps so, for now that dark elves walk in the sunlight, wearing armor that turns the sharpest blades and strongest spells. They are poised to conquer the fabulous Hollow World. But what is this armor? How does its creation involve the ancient, mile-long Great Annelids, as well as those wondrous creatures, the feathered serpents? The mystery's solution draws your heroes across three thousand miles, from ruins to seaports, through the trackless caverns beneath the World's Spine, and finally to the eternal land of Nithia. There, your heroes discover the true meaning of... NIGHTRAGE! 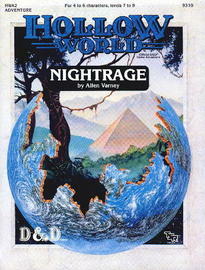 Nightrage is the second part of the far-ranging Blood Brethren trilogy. You can play these three HOLLOW WORLD modules in any order, or play this 64-page adventure by itself!" "The all-powerul immortals have vanished! The quest to locate them has led across the Atlas Ocean to the land of Shahjapur, where moguls hunt tigers, untouchables respectfully avoid higher castes, and holy fakirs perch immobile for years on end. In this land of shrines and elephants and shapeshifting assassins, resolution may lie at the end of the mysterious "Emerald River." But no one knows the location of this river and no map shows its bed. Does the answer lie within the Temple of Eight Sweet Winds? Hopefully so, for time grows short. The Immortals themselves must be found and enlisted - to stave off the approaching cataclysm called: NIGHTSTORM! 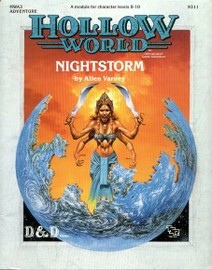 Nightstorm is the third adventure for the D&D HOLLOW WORLD Campaign Set." The emperor is dead... long live the emperor! But is the new emperor a man of the people, or a tool in the hands of malevolent powers? Walk carefully, for no stranger is safe upon the streets these days, and adventurers least of all! The mood of the capital city is turning ugly. Minions of the new emperor look on uncaring, while citizens disappear and philosophers fall to heedless mobs. The old emperor's elite guards are disbanded and scattered. Disorder reigns, and restless citizens threaten open revolt. And yet... a whisper is heard. Civil war can be averted. An ancient artifact, the Milenian Scepter, can rally those who would serve the Empire best. But the Scepter has been lost for generations, and who can say where it might be? This stand-alone adventure is compatible with the WRATH OF THE IMMORTALS boxed set and the accessory HWR3, The Milenian Empire."